The biggest crisis in the Democratic Party today is its utter failure to present a coherent, inspiring message to Americans. Voters have no idea what Democrats stand for or how the party plans to improve their lives. If you want to see a perfect example of why Democrats are so god-awful at communicating, take a look at the clip below of Ohio senator Sherrod Brown’s appearance on last Sunday’s Meet the Press. In our previous post we critiqued the messaging behind the “A Better Deal” campaign, the Democratic Party’s awkward first step toward populism. Though we awarded points for trying, we also criticized the messaging as wonky, muddled, overly complex, and way too timid in its attack on conservatives. And as always, Democrats failed to relate their policies to core American and moral values. Here is Pelosi’s original op-ed. Our rewrite is below. We’ll let you decide if it’s better, worse, or just more of the same. Recently the Democrats launched their new “A Better Deal” campaign, a supposedly populist plan to help American workers by creating jobs and better wages, lowering the cost of living, and building a stronger economy. It’s a great idea in theory. As we’ve said in previous posts Democrats must step in to fill the power vacuum created by Republican incompetence and the Trump scandals. They also desperately need to create an identity—to tell Americans what Democrats stand for and how voting Democratic will improve their lives. “A Better Deal” is the first wobbly baby step in that direction. Unfortunately, as game as the effort was, the rollout perfectly illustrated what’s wrong with Democratic messaging: timidity, politeness, wonkishness, and a tin ear for populism. Here are a few ways it could have been better. The campaign rollout reeked of decision-by-committee. According to op-eds from Nancy Pelosi in the Washington Post and Chuck Schumer in The New York Times, the campaign seems to be about three things: creating jobs (great! ), lowering prescription drug costs (um, OK), and regulating corporate mergers to prevent monopolistic price gouging (huh?). It’s such as strangely random, disjointed set of proposals, and there are only three of them. That’s their bold populist agenda? This is the new message that will send millions of voters rushing to reregister as Democrats? Sure, those aren’t bad ideas. But they’re not inspiring. They don’t constitute a vision. Democrats need a radical rebranding—and this isn’t it. Democrats need a comprehensive, rousing message that tells American workers the concrete ways Democrats will change their everyday lives. Which brings us to our second point. Voters generally want to know one thing from a political party: How are you going to make my life better? But on that simple question, the Democrats’ message seemed muddled—at once underwhelming and overly complex. If you look at the “Better Deal” web page, it’s a text-heavy mishmash of ideas—trade, corporate outsourcing, corporate mergers, apprenticeship programs, high-speed internet, and on and on. All of them are worthwhile, no doubt, but how will they help me? It’s not always easy to tell. The more esoteric proposals—mergers, trade, the internet—should have been left for later, once America has bought in to their concept. Beyond the messages themselves, the marketing rollout of “A Better Deal” seemed oddly tepid, considering the party’s future may be hanging on it. We saw a couple of prominent op-eds, Schumer on a Sunday political talk show, and a sparsely attended press conference. (Oddly, you still can’t find the proposals on the Democrats.org website, which is the first place curious people will look; it’s only on their Senate site.) The “Better Deal” campaign did get some modest press coverage, but then was just as quickly forgotten. Future announcements will most likely be less newsworthy than the kickoff, and therefore less covered. Op-eds and five minutes on a Sunday talk show are great, but those are outlets for high-information voters. How will Democrats get their critical messages to the masses? We’ve argued in previous posts that the Democratic Party urgently needs a major rebranding campaign. It should be a full-on media blitz from a top ad agency: TV, radio, newspaper ads—the works—at least in important swing states. And before they get into the particulars of their policies, they need to soften up the electorate with a general rebranding of the party. That would all be hideously expensive, of course, but if Democrats really want to turn voters around, they have to make a splash. And they have to preach to the street, not to the choir. Absent that, at the very least every Democrat should be talking about “A Better Deal” over the summer (and we haven’t heard much so far); it can’t just be a one-day event. We can only hope future announcements on “A Better Deal” will keep the Democratic messages in the public eye, but they can use some work. Relate it to core American values. That’s fine as far as it goes, but it’s a reason, not a value. It doesn’t speak to the deeper philosophical beliefs that underlie the policy. Fairness and equality: Americans believe that everyone is created equal. But conservative policies have tipped the game toward the rich and powerful. We need to level the playing field for American workers. The American Dream: Everyone has a right to fully participate in the American way of life and to pursue happiness and prosperity. We have to make sure workers don’t lose sight of that dream. Fighting for the underdog. Americans fight for underdogs, and right now American workers need a champion. Their voices are being drowned out by special interests with money and lobbyists. Optimism: Democrats believe we can make our country better because we have made it better. Democrats have been improving the lives of workers for a hundred years. American exceptionalism: America is the greatest, richest, most powerful nation on earth. Workers deserve a better deal, and they have a right to ask for a better life. In a coming post, we’ll show how to weave these basic values into the “Better Deal” narrative to create a more powerful message. Democrats have an exasperating habit of pulling their punches in the fight against conservatives, and it was on full, maddening display in the rollout of “A Better Deal.” You’d think this would be the perfect time for a bare-knuckles attack on Republicanism, including the failure of their trickle-down economics and their fawning obeisance to the rich at the expense of America’s workers. But at the Democrats’ press conference we got nothing of the kind. In their op-eds we got a few perfunctory words of disapproval. In the 40 years since Reagan, liberals have been relentlessly bashed by Republicans—why don’t Democrats ever return the favor? Democrats: Stop being so polite! Of course, criticizing is easy. In coming posts, we’ll try to walk the walk. We’ll rewrite Pelosi’s Washington Post op-ed according to the principles we’ve just described, and we’ll try our hand at a TV commercial to sell the idea to the general public. As delicious as it is to watch the Republican Party floundering in the wake of Trump scandals and their own incompetence, Democrats are making a grave mistake if they just stand by gleefully watching the fiasco. With conservatives on the ropes because of their cruel budget, widely despised health plan, and other missteps, Democrats should seize the moment to counterpunch. They should be aggressively laying out their own agenda for the nation, contrasting their positions with Republicans, and helping voters visualize how much better life would be under Democratic governance. They should be telling Americans what their budget would look like and how they would fix health care. In normal times that position might make sense, but these are not normal times. Conservatives have never been more vulnerable. One of the biggest reasons for the Democrats’ catastrophic loss in 2016 was that they had no coherent message and no real identity as a party. With the crucial 2018 midterms already approaching, voters need to know who Democrats are and what they stand for. Americans today are desperate for leadership. Democrats should give them some. We’re assuming that question was rhetorical (whether Trump realizes it or not), but just for the record, we thought we’d answer it anyway. Just off the top of our head, here are eight important things black people (and Americans generally, for that matter) could lose by voting for Trump. Hillary Clinton spent some time in her early activist years working on civil rights issues in the South. She has earned support from the black community for showing concern for black issues and for developing an agenda to address them. According to two extensive reports by Moody’s Analytics, Trump’s economic proposals could cause a “lengthy recession” and cost Americans over 3 million jobs. Clinton’s proposals would add more than 10 million jobs. A recent federal appeals court decision struck down North Carolina’s GOP-enacted voter ID law, saying the restrictions “target African Americans with almost surgical precision” in their attempts to suppress voting. Trump and his Republican Party aggressively support similar laws in other conservative states. Black people who have trouble securing the proper voting identification would be unable to vote in elections. Voter ID laws hit hardest at the elderly, students, low-income voters, and those without easy access to transportation. Clinton has been supportive of calls to reduce police violence, unequal treatment, and racial profiling of African Americans. Donald Trump and Republicans have shown contempt for the Black Lives Matter movement and hostility toward the issues black people are raising. Trump, in fact, has called for police to be more aggressive. Trump has vowed to repeal the current health care law and replace it with a vastly inferior version. Millions of black people enrolled in Obamacare or in expanded Medicaid would stand to lose their current health insurance. If Trump’s Republican Party manages to pass the federal budget that House Speaker Paul Ryan has outlined, it would devastate social services in America. Republicans have already tried to pass major cuts to food stamps for America’s poorest citizens (they were stopped by Democrats). Since poverty and unemployment disproportionately affect African Americans, those cuts would disproportionately harm black people. Trump has made contradictory statements about whether he would support a raise in the minimum wage, but he apparently doesn’t support an increase to $15, as Democrats do. And his party is dead-set against any federal raise at all, saying it should be left to the states. Any black households with a family member working a minimum-wage job would most likely not see any meaningful raise in the national rate under Trump. Clinton and the Democratic Party are fighting for all of those significant improvements to the lives of workers. Like all Americans, black people will have to depend on Democrats winning office to achieve any of them. The values she and the Democratic Party believe in, and how they relate to traditional American and religious/humanitarian values. Democrats are the party of working people and the poor. Democrats are the true party of reform. Because blue-collar voters in swing states are so crucial to this election, we thought we’d watch a couple videos of Hillary Clinton’s stump speeches, to see what messages she was bringing to the hard-working people of Ohio, Florida, and the country at large. A few jabs at Trump, but no major contrasts between progressive and conservative values and beliefs, and no full-on attack on conservatism. With Trump at the top of the ticket, Democrats have a golden opportunity to sully the conservative brand by linking it to him. Why aren’t they doing it? No point-by-point rundown of what Democrats will do for blue-collar workers. She does talk in detail about policies, and they will help the middle class, but she doesn’t really frame them as such. As much as we’re fans of Clinton, she will never be a captivating speaker. Fine. But at least her messages can be sharp. Sadly, they aren’t. They’re not even close. Clinton’s stump speech is as dry and lifeless as a poli-sci lecture from your least-favorite professor. It’s all head and no heart. All this is important, sure—and certainly a contrast to Trump’s mindless generalities. But good Lord, where is the soul? After all that’s happened this election season, Madame Secretary—after all we’ve learned about the pent-up anger and frustration of the electorate—this is what you think voters are hungry to hear? Infrastructure? Americans need spiritual nourishment. They need a leader who understands that many of them feel abandoned by politicians who seem more interested in money and special interests than in improving the lives of everyday people. They need to know what you stand for. They need inspiration. Start with the general and work toward the specific. Begin with a declaration of your values—not your policy positions. Tell your audience what you and the Democratic Party believe in, and how those beliefs reflect traditional American values. Throw in a dollop of patriotism, American exceptionalism, and positivity. Remind us why we’re proud to be Americans. Outline three or four major issues—the ones most important to your audience. Unlike Clinton, try to avoid a laundry list of position statements. Be specific, and use anecdotes and unassailable facts to make your case. Describe how you’re going to tackle those issues. Contrast your views with your opponent’s. Globalize your argument—don’t just attack your opponent, attack conservatism. Try to undermine the very foundation of conservative ideology. End on a hopeful, upbeat note and a call to action. In our next post, we’ll try to practice what we preach and take a stab at writing the stump speech Clinton should be delivering. For months now The Liberal Message has been begging Democratic candidates to never talk about policies without talking about values—that is, the core beliefs that underline those policies, such as fairness, equality, personal freedoms, helping people in need, etc. So we were thrilled to run across a recent blog post by a bona fide Smart Person with actual readers who says the same thing. Every Democratic candidate should read this essay by George Lakoff, the UC Berkeley professor of cognitive science who wrote the famous book Moral Politics (which describes the “strict father”/”nurturing parent” psychology that underlies conservative and liberal beliefs, respectively). This latest essay is mostly about the psychological mechanisms that make Trump and his supporters tick, but the good stuff for Democrats is the last section, on how progressive candidates can counter the Trump/GOP messaging. Start with a discussion of values and then relate policies to them. Stay positive, emphasize facts, and use repetition in making your case. Support unions (as an instrument of freedom for workers). Don’t let yourself be drawn into mudslinging. Channel President Obama and keep it classy. De-emphasize identity politics. Democratic constituencies are important, but be sure to speak inclusively, for everyone (including, he says, poor white Americans; see our previous post). Lakoff has lots more good details. 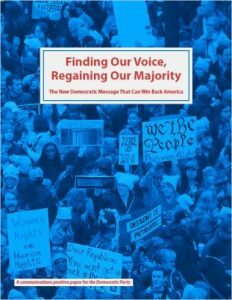 It’s valuable reading and a complementary viewpoint to our own 7 Winning Messages for Democratic Politicians.